George Ames Plimpton was an American journalist, writer, editor, and actor. He is widely known for his sports writing and for helping to found The Paris Review. Plimpton was born in New York City, the son of Francis T.P. Plimpton and his wife, Pauline Ames. The family was socially prominent. Plimpton's father worked as both a corporate lawyer and, during the 1960s, as a deputy U.S. representative to the United Nations. Plimpton attended a high-profile prep school, Phillips Exeter Academy, but was expelled. He later entered Harvard University where he remained until he left to serve in World War II. While on a break from Cambridge in 1953, Plimpton was hired as the first editor of the Paris Review after it was founded by Peter Matthiessen and Harold L. Humes. The quarterly publication never had a large circulation but soon became influential in literary circles. In addition to publishing authors when they were up and coming, including Jack Kerouac, Jay McInerney, and Philip Roth, Plimpton also put in print lengthy interviews with established literary figures such as Ernest Hemingway in which they talked about their craft. Plimpton's association with the Paris Review led to friendships with many famous writers, though the periodical was also a financial drain on those involved because it was never profitable and involved much creative fund-raising by Plimpton and others. The Paris Review 's headquarters moved from Paris, where it had its first offices, to wherever Plimpton was based. When he returned to the United States in the late 1950s, the magazine soon followed. Plimpton did not just work on the Paris Review, but also worked in other writing-related positions. From 1956-58, he taught at Barnard College at Columbia University. He was an associate of Horizon magazine from 1959-61. He was later an editor and writer of Harper's magazine from 1972-81. Plimpton also had his own writing career. In 1955, he published a children's book, The Rabbit's Umbrella. Fiction, however, was not to be his main focus. 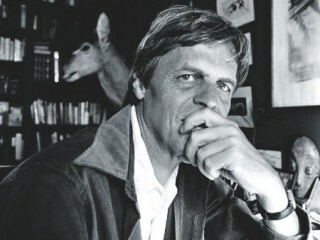 Beginning in the late 1950s, Plimpton began doing participatory journalism pieces, first for magazines like Sports Illustrated and later in his own books. One of his first experiences was boxing with light heavyweight champion Archie Moore in 1959, the same year he pitched to all-star players at Major League Baseball's All-Star Game and to leading players of the day like Willie Mays. Plimpton's first participatory book was 1961's Out of My League, which chronicled his experiences in baseball. Such books helped establish Plimpton as a writer with the American public, doing what they could only imagine and describing his experiences for their pleasure. Plimpton went on to play goalie for two professional hockey teams, the Boston Bruins and the Edmonton Oilers, basketball with the Boston Celtics, tennis against a professional, and in pro-am golf tournaments. One of Plimpton's best-known books was 1963's Paper Lion. In this tome, he chronicled his experiences trying out for and playing third string quarterback for the Detroit Lions, a professional football team. He tried to keep his season-long experience under wraps, but was found out. Nonetheless, the book was popular enough to be made into a film in 1968. Plimpton also played a role in more serious news events. A life-long friend of Robert F. Kennedy, he was present when Kennedy, then a Democratic presidential candidate in 1968, was assassinated by Sirhan Sirhan. Plimpton was one of two men who grabbed the assassin, held him down, and took the gun from his hand. Plimpton continued to do participatory journalism, run the Paris Review, and work on other literary-related projects until his death. He died on September 26, 2003, in his sleep at his apartment in Manhattan after suffering from heart problems; he was 76. Upon Plimpton's death, his friend Norman Mailer told Mary Rourke and Claudia Luther of the Los Angeles Times, "George had a rare gift. He was so open to life and all of its new and unexpected situations." Plimpton's 20-year marriage to Freddy Medora Espy ended in divorce in 1988. He is survived by his second wife, Sara Whitehead Dudley, two children from his first marriage, Medora Ames and Taylor Ames, and two from his second marriage, twins Olivia Hartley and Laura Dudley. View the full website biography of George Plimpton.